Mars Piloted Orbital Station (or MARPOST) is a Russian concept for an orbital Human mission to Mars, with several proposed configurations, including using a nuclear reactor to run an electric rocket engine. A 30-volume draft proposal was produced in 2005. The design for the proposed ship was planned to be ready in 2012, and the ship itself in 2021. Marpost would be launched to Mars together with a fleet of robotic spacecraft designed to study the planet both from its orbit and on its surface, while humans will not land on the red planet. 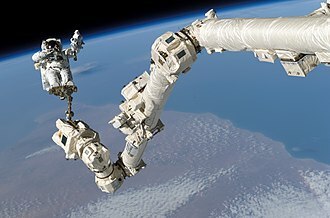 The station would reach the Mars orbit from where its crew will research Mars by operating the robots; for this reason the mission is called ‘hybrid’. Since the robots will be controlled by Marpost crewmembers from Martian orbit it will eliminate one of the basic problems of robotic Mars missions, the 14 minutes delay for radio signals to reach the Earth. Samples of Martian soil will then be delivered by these robots to Marpost and later brought back to Earth. The whole duration of the flight is set for 2.5 years with one month of work in Mars orbit. The mission would also prove that people can survive a lengthy trip through deep space and effectively perform their professional responsibilities, including operating the spacecraft and conducting research activities. The idea of this ‘hybrid’ mission was first advanced by US-trained Russian space policy expert Dr. Yuri Karash; he got his Ph.D. in Space Policy and International Relations from the American University in Washington, D.C. in 1997. His article was published in the Russian Nezavisimaya Gazeta on October 18, 2000 under the title Vperyod, Na Mars! Rossii sleduyet vzyat kurs na sozdaniye marsianskoi pilotiruemoy orbitalnoy stantsii [Onward, to Mars! Russia needs to set a course toward the development of a Martian Piloted Orbital Station]. Karash claimed that Russia, while continuing its participation in the International Space Station program, should build the rest of Russian modules for the station but instead of attaching them to the ISS, assemble them in orbit as an autonomous complex and launch it to Mars with a crew on board. He also gave this space complex its name MARPOST. Further concepts see Marpost to pave the way for a joint Russian-American mission to the Martian surface. Russia, capitalizing on its extensive experience in building and operating long-term orbital space stations, would build a trans-planetary spacecraft while America, capitalizing on its experience gained during the Apollo Moon landing program, would build a Mars landing module. The idea of Marpost was then picked up by Leonid Gorshkov, one of the main designers of the RKK Energia (Raketno-Kosmicheskaya Korporatsiya – Rocket-Space Corporation) company, the leading Russian space developer and builder of human spaceflight hardware. Gorshkov proposed to use the space complex called MEK (Mezhplanetniy Ekspeditsioniy Komplex, or Interplanetary Expeditionary Complex), that was already developed and designed by RKK Energia. The projected cost would be $14–16 billion and the period of realization 12–14 years. 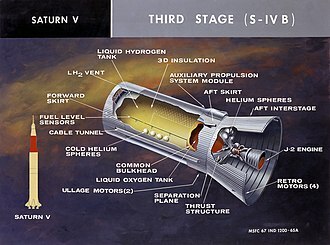 The elements of MEK were initially designed to be launched into space by the Energia heavy booster, resembling the Saturn V moon booster by its payload capacity. Later however, in order to lower the cost of the mission, the elements of MEK were redesigned to be launched by a Proton or Angara rocket. The overall weight of MEK is about 400 tons. The flight from earth orbit to Mars will be powered by ion thruster engines. ^ Yury Zaitsev (30 March 2005). "Russia Suggests Manned Matrian-Mission Plan". Rianovosty. ^ Vladimir Isachenkov (29 October 2009). "Russia Hopes To Fly Humans To Mars With Nuclear Spaceship". The Huffington Post. ^ Yuri Karash (12 January 2005). "'The heart' of the Martian Spacecraft". Nezavisimaya Gazeta. ^ "Human Mission to Mars". Russian Cosmonautics Academy, Moscow-Korolev. 2006. Archived from the original on 2008-11-08. Fictional representations of Mars have been popular for over a century. Almost as popular as stories about Mars are stories about Martians engaging in activity away from their home planet, exploration of the planet has continued in the 21st century on to the present day. Flammarion assumed its red surface came from red-colored vegetation, and Schiaparelli observed what he took to be linear features on the face of Mars, because the Italian for channels is canali, English translations tended to render the word as canals, implying artificial construction. Lowells books on Mars expanded on this notion of Martian canals, and it was frequently speculated that ancient Martian civilizations had constructed irrigation works that spanned the planet in an attempt at saving their dying world. This concept spawned a number of science fiction scenarios. The following works of fiction deal with the planet itself, with any assumed Martian civilization as part of its planetary landscape, several early modern writers, including Athanasius Kircher and Emanuel Swedenborg, hypothesized contact with Mars. 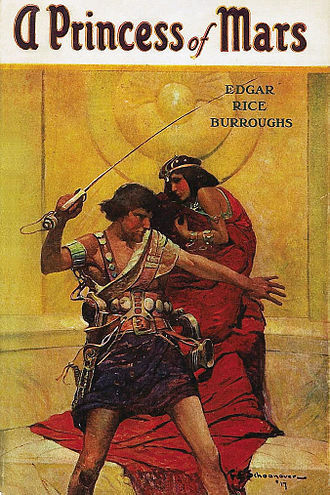 Early science fiction about Mars often involved the first voyages to the planet, sometimes as an invasion force, across the Zodiac by Percy Greg. The narrator flies his craft, the Astronaut, to visit diminutive beings on Mars, a young astronomer and his fiancée are killed in a ballooning accident, and are reincarnated in new bodies on Mars. Melbourne and Mars, My Mysterious Life on Two Planets by Joseph Fraser, Mr. Strangers Sealed Packet by Hugh MacColl. People from Earth travel to Mars in a machine, and find peaceful Martians that are technologically inferior to humans with a few exceptions like voice-recording devices. A Plunge into Space by Robert Cromie and some friends travel to Mars and find a society where there is no need for politicians, and Martians who travel in airships or flying through levitation. Unveiling a Parallel by Alice Ilgenfritz Jones and Ella Merchant, the authors use a journey to Mars as the frame for a utopian feminist novel. Journey to Mars by Gustavus W. Pope, an adventure story that may have influenced Edgar Rice Burroughss books. This article is a subarticle of Nuclear power. A nuclear reactor, formerly known as a pile, is a device used to initiate. 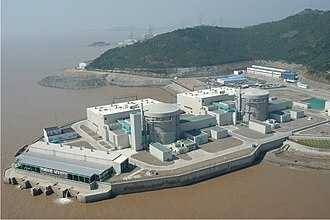 Nuclear reactors are used at power plants for electricity generation. Heat from nuclear fission is passed to a fluid, which runs through steam turbines. These either drive a ships propellers or turn electrical generators, Nuclear generated steam in principle can be used for industrial process heat or for district heating. Some reactors are used to produce isotopes for medical and industrial use, some are run only for research. As of April 2014, the IAEA reports there are 435 nuclear power reactors in operation, when a large fissile atomic nucleus such as uranium-235 or plutonium-239 absorbs a neutron, it may undergo nuclear fission. The heavy nucleus splits into two or more nuclei, releasing kinetic energy, gamma radiation, and free neutrons. A portion of neutrons may be absorbed by other fissile atoms and trigger further fission events, which release more neutrons. This is known as a chain reaction. A Mars landing is a landing of a spacecraft on the surface of Mars. Of multiple attempted Mars landings by robotic, unmanned spacecraft, seven have been successful, there have been studies for a possible human mission to Mars, including a landing, but none have been attempted. As of October 2016, all methods of landing on Mars have required an aeroshell and parachute sequence, a stationary lander can drop from the parachute back shell and ride retrorockets all the way down, but a rover cannot be burdened with rockets that serve no purpose after touchdown. One method is to enclose the rover in a structure which in turn is enclosed in airbags. After the aeroshell drops off, the tetrahedron is lowered clear of the back shell on a lanyard so that the airbags can inflate. When it nears the ground, the tetrahedron is released to drop to the ground, when it has come to rest, the tetrahedron opens to expose the rover. If a rover is too heavy to use airbags, the retrorockets can be mounted on a sky crane, the sky crane drops from the parachute back shell and, as it nears the ground, the rover is lowered on a lanyard. When the rover touches ground, it cuts the lanyard so that the sky crane will crash well away from the rover, all three methods have advantages and disadvantages, requiring careful consideration by the engineers. For landers that are heavier than the Curiosity rover, engineers are developing a combination rigid-inflatable Low-Density Supersonic Decelerator that could be 8 meters in diameter. It would have to be accompanied by a proportionately larger parachute, beginning with the Mars Exploration Rovers, landers on the surface of Mars have used orbiting spacecraft as communications satellites for relaying their data to Earth. 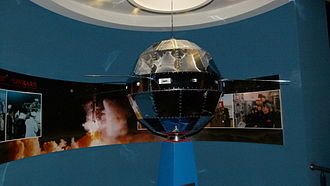 The landers use UHF transmitters to send their data to the orbiters, the first probe intended to be a Mars impact lander was the Soviet Mars 1962B unsuccessfully launched in 1962. 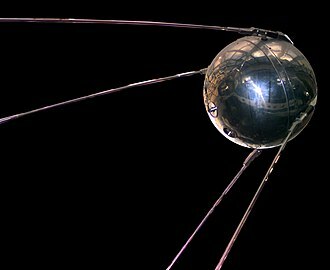 In 1971 the Soviet Union successfully sent probes Mars 2 and Mars 3, the Mars 2 and 3 probes each carried a lander, both of which failed upon landing. They were the first human artifacts to touch down on Mars and these spaceprobes contained the first mini-Mars rovers, although they were broken on landing. The Roscosmos State Corporation for Space Activities, commonly known as Roscosmos, is the governmental body responsible for the space science program of Russia and general aerospace research. The Corporation was established on the basis of the now-defunct Federal Space Agency on December 28,2015, Roscosmos was previously known as the Russian Aviation and Space Agency. The headquarters of Roscosmos are located in Moscow, while the main Mission Control space center is located in the city of Korolev. The Yuri Gagarin Cosmonaut Training Center is in Star City, the Launch facilities used are Baikonur Cosmodrome in Kazakhstan, and Vostochny Cosmodrome being built in the Russian Far East in Amur Oblast. The current Director since January 2015 is Igor Komarov, in 2015 the Russian government merged Roscosmos with the United Rocket and Space Corporation, the re-nationalized Russian space industry, to create the Roscosmos State Corporation. The Soviet space program did not have central executive agencies, its organizational architecture was multi-centered, it was the design bureaus and the council of designers that had the most say, not the political leadership. 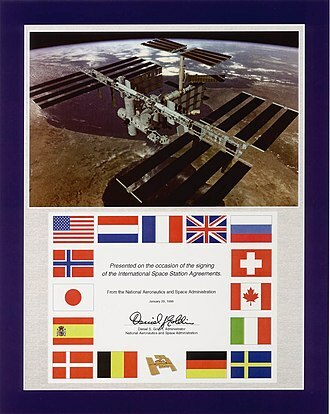 The creation of a central agency after the separation of Russia from the Soviet Union was therefore a new development, Russian Space Agency was formed on February 25,1992, by a decree of President Yeltsin. 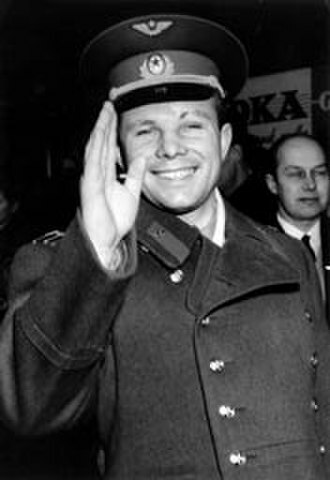 Yuri Koptev, who had worked with designing Mars landers at NPO Lavochkin. In the early years, the agency suffered from lack of authority as the design bureaus fought to protect their own spheres of operation. For example, the decision to keep Mir in operation beyond 1999 was not taken by the agency, another example is that the decision to develop the new Angara rocket was rather a function of Khrunichevs ability to attract resources than a conscious long-term decision by the agency. The 1990s saw serious financial problems because of decreased cash flow and this resulted in Roscosmos leading role in commercial satellite launches and space tourism. In March 2004, director Yuri Koptev was replaced by Anatoly Perminov, the Russian economy boomed throughout 2005 from high prices for exports, such as oil and gas, the outlook for future funding in 2006 appeared more favorable. Aquarius is an underwater habitat located 3.5 miles off Key Largo, Florida in the Florida Keys National Marine Sanctuary. It is deployed on the floor next to deep coral reefs 62 feet below the surface. NASA has used it since 2001 for a series of space exploration missions, usually lasting 7 to 14 days. The mission had cost about 500 million U. S. dollars, the crew members are called aquanauts, and they perform EVAs in the underwater environment. A technique known as saturation diving allows the aquanauts to live, after twenty four hours underwater at any depth, the human body becomes saturated with dissolved gas. With saturation diving, divers can accurately predict exactly how much time they need to decompress before returning to the surface and this information limits the risk of decompression sickness. By living in the Aquarius habitat and working at the depth on the ocean floor. For NASA, the Aquarius habitat and its surroundings provide an analog for space exploration. Much like space, the world is a hostile, alien place for humans to live. NEEMO crew members experience some of the same challenges there that they would on a distant asteroid, during NEEMO missions, the aquanauts are able to simulate living on a spacecraft and test spacewalk techniques for future space missions. A human mission to Mars has been the subject of science fiction and scientific proposals since the 19th century. The plans comprise proposals to land on Mars, eventually settling on and terraforming the planet, while utilizing its moons, the exploration of Mars has been a goal of national space programs for decades. The list of manned Mars mission plans in the 20th century shows the various proposals that have been put forth by multiple organizations. 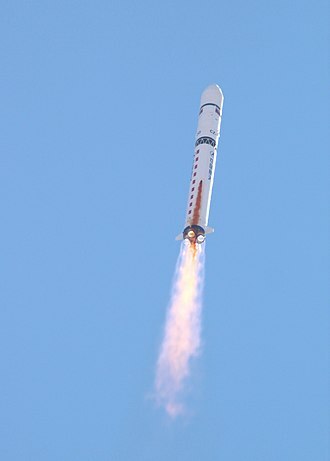 In the 2010s, numerous Chinese and American agencies are developing proposals for human missions to Mars, none have moved past the planning stages. In fiction, the concept of traveling to and terraforming Mars has been explored in books, graphic novels. The appeal of space-travel to the planet is an aspect to Mars in fiction. The energy needed for transfer between planetary orbits, or ∆V, is lowest at intervals fixed by the synodic period, for Earth / Mars trips, this is every 26 months, so missions are typically planned to coincide with one of these launch windows. The energy needed in the windows varies on roughly a 15-year cycle with the easiest windows needing only half the energy of the peaks. In the 20th century, there was a minimum in the 1969 and 1971 launch windows and another low in 1986 and 1988, several types of mission plans have been proposed, such as the opposition class and conjunction class, or the Crocco flyby. Shorter Mars mission plans have round-trip flight times of 400 to 450 days, a fast Mars mission of 245 days round trip could be possible with on-orbit staging. In 2014 Ballistic capture was proposed, which may reduce fuel cost, in the Crocco grand tour, a crewed spacecraft would get a flyby of Mars and Venus for under a year in space. Some flyby mission architectures can be extended to include a style of Mars landing with a flyby excursion lander spacecraft, proposed by R. Titus in 1966, it involved extending a flyby mission with a short stay lander. Basically, a short stay lander-ascent vehicle would separate from a parent Earth-Mars transfer prior to its flyby of Mars, the estimated cost of sending humans to the red planet is roughly 500 billion U. S. dollars, though the actual costs are likely to be more. Mars to stay missions propose astronauts sent to Mars for the first time should intend to stay. Unused emergency return vehicles would be recycled into settlement construction as soon as the habitability of Mars becomes evident to the initial pioneers, Mars to Stay missions are advocated both to reduce cost and to ensure permanent settlement of Mars. Among many notable Mars to Stay advocates, former Apollo astronaut Buzz Aldrin has been outspoken, suggesting in numerous forums Forget the Moon. And, in June 2013, Aldrin promoted a mission to homestead Mars. The Mars Underground, Mars Homestead Foundation, Mars One, and Mars Artists Community advocacy groups and business organizations have adopted Mars to Stay policy initiatives. 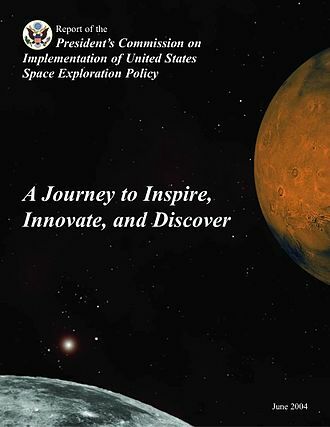 The earliest formal outline of a Mars to Stay mission architecture was given at the Case for Mars VI Workshop in 1996, during a presentation by George Herbert titled One Way to Mars. 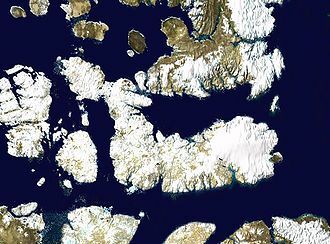 Since returning the astronauts from the surface of Mars is one of the most difficult parts of a Mars mission, Paul Davies, writing in the New York Times in 2004, made similar arguments. Supplemented by food shipments, medical supplies, and replacement gadgets from Earth, under Mars to Stay mission architectures, the first humans to travel to Mars would typically be in six-member teams. After this initial landing, subsequent missions would raise the number of persons on Mars to 30, through the use of digital fabricators and in vitro fertilisation it is assumed a permanent human settlement on Mars can grow organically from an original thirty to forty pioneers. The first generation can retire there, or maybe we can bring them back, an article by Dirk Schulze-Makuch and Paul Davies from the book The Human Mission to Mars, Colonizing the Red Planet highlights their mission plans as, No base on the Moon is needed. Given the broad variety of resources available on Mars, the survival of Martian settlers is much more feasible than Lunar settlers. Since Mars affords neither a shield nor magnetospheric protection, robots would prepare a basic modular base inside near-surface lava tubes. A Mars habitat is a place that humans can live in on Mars. Mars habitats must contend with surface conditions that include almost no oxygen in the air, extreme cold, low pressure, the habitat may be placed underground which helps solve some problems but creates new difficulties. One of the challenges for Mars habitats is maintaining the climate, things like electronics and lights generate heat that rises in the air, even as there are extreme temperature fluctuation outside. 3D Printing Mars atmospheric entry Caves of Mars Project While it is possible for humans to breathe pure oxygen, as such, Mars habitats may have a need for additional gases. One possibility is to take nitrogen and argon from the atmosphere of Mars, however, as a result, a Mars habitat may use 40% argon, 40% nitrogen, and 20% oxygen. Another concept for breathing air is to use re-usable amine bead carbon monoxide scrubbers, while one carbon monoxide scrubber filters the astronauts air, the other is vented to the Mars atmosphere. One early idea for a Mars habitat was to use put short stay accommodation in a Mars ascent-descent vehicle and this combination was called a Mars Excursion Module, and typically featured other components such as basic rover and science equipment. 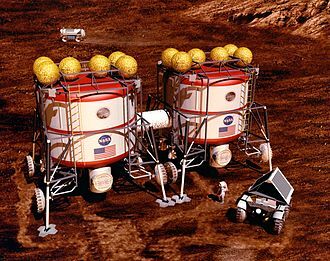 Later missions tended to shift to a dedicated descent/ascent with a separate habitat, in 2013 ZA architects proposed having digging robots build a Mars habitat underground. They chose an interior inspired by Fingals Cave and noted the protection from high-energy radiation below ground. On the other hand, the issue of the difficulty of sending digging robots that must construct the habitat versus landing capsules on the surface was noted. An alternative may be to build above ground, but use thick ice to shield from radiation, in 2015 the SHEE project noted the idea of autonomous construction and preparation for Mars habitat versus human construction. In early 2015 NASA outlined a plan for three stage Mars habitat design and construction award program. Mars is the focus of much scientific study about possible human colonization. Its surface conditions and the presence of water on Mars make it arguably the most hospitable of the planets in the Solar System, Mars requires less energy per unit mass to reach from Earth than any planet except Venus. Permanent human habitation on a body other than the Earth is one of science fictions most prevalent themes. As technology has advanced, and concerns about the future of humanity on Earth have increased, other reasons for colonizing space include economic interests, long-term scientific research best carried out by humans as opposed to robotic probes, and sheer curiosity. Earth is similar to Venus in bulk composition and surface gravity and these include, The Martian day is very close in duration to Earths. A solar day on Mars is 24 hours,39 minutes and 35.244 seconds, Mars has a surface area that is 28. 4% of Earths, only slightly less than the amount of dry land on Earth. Mars has half the radius of Earth and only one-tenth the mass and this means that it has a smaller volume and lower average density than Earth. Mars has a tilt of 25. 19°, similar to Earths 23. 44°. As a result, Mars has seasons much like Earth, though they last nearly twice as long because the Martian year is about 1.88 Earth years, the Martian north pole currently points at Cygnus, not Ursa Minor like Earths. Recent observations by NASAs Mars Reconnaissance Orbiter, ESAs Mars Express, the surface gravity of Mars is 38% that of Earth. Although microgravity is known to cause problems such as muscle loss and bone demineralization. The Mars Gravity Biosatellite was a project designed to learn more about what effect Marss lower surface gravity would have on humans. Mars is much colder than Earth, with surface temperatures between 186 and 268 K. The lowest temperature recorded on Earth was 180 K in Antarctica. Surface water on Mars may occur transiently, but only under certain conditions, because Mars is about 52% farther from the Sun, the amount of solar energy entering its upper atmosphere per unit area is only around 43. 3% of what reaches the Earths upper atmosphere. 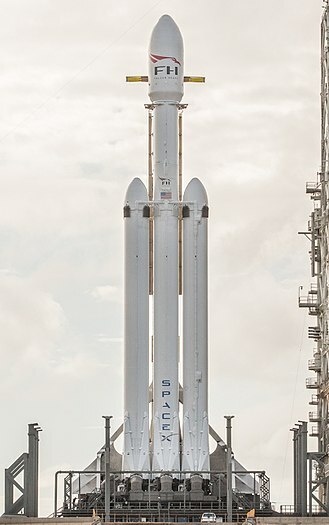 SpaceX Falcon Heavy, with more launch capacity than the Space Shuttle, was used to send a test payload beyond the orbit of Mars in early 2018. The Mars Society's Mars Desert Research Station located near Hanksville, Utah. 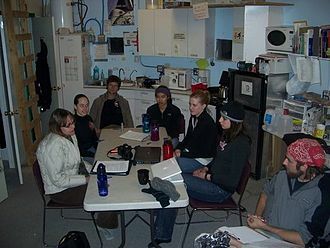 Crew 73 meets with writer Laurie Schmidt upstairs in the Hab. Concordia Research Station at Dome Circe, Charlie or Concordia. NEEMO 5 crew members are pictured in the bunkroom aboard the Aquarius research habitat. Top, L–R: Reisman, Hwang; Middle: Whitson, Anderson; Bottom: Talacek, Snow. The NEEMO 9 crew: Left to right (rear): Broderick, Williams; front: Stott, Garan. THEMIS image of probable cave entrances on Arsia Mons. The pits have been informally named (A) Dena, (B) Chloe, (C) Wendy, (D) Annie, (E) Abby (left) and Nikki, and (F) Jeanne. A HiRISE image of a lava tube skylight entrance on the Martian volcano Pavonis Mons. Two Quest Kodiaks and a Cessna 421 on the ground in Driggs, Idaho. Use of these private aircraft greatly enabled the 2013 FMARS expedition. "Ares Vallis" as photographed by Mars Pathfinder (click image for detailed description). Concept art by NASA of two people in suits on Mars setting up weather equipment. NASA concept of Mars-crew analyzing a sample (2004). NASA's Curiosity rover and its parachute were spotted by NASA's Mars Reconnaissance Orbiter as the probe descended to the surface. August 6, 2012. 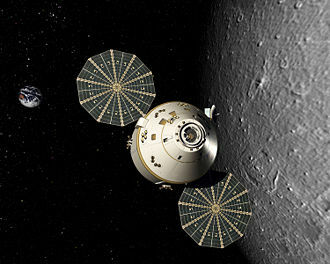 "Send Two People, Take Everyone"
Artist's Concept of Inspiration Mars Capsule and Hab. The BYU Mars Rover undergoing field tests at the Mars Desert Research Station. 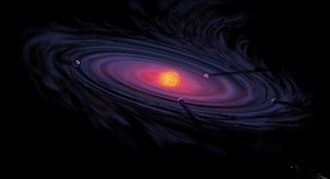 This space art, titled The Next Stop was selected by the ESA when discussing its Aurora program.